The Dow is poised to finish the year on a positive note once again. One of the most striking developments in the Dow in 2014 was the widely differing returns of the average's technology stocks. On one hand, chipmaker Intel (NASDAQ:INTC) soared more than 46% over the course of the year as investors celebrated the resurgence of the PC and Intel's ability to capitalize on that unexpected positive trend. As older operating-system software became obsolete and stopped receiving technical support from its manufacturer, computer owners had little choice but to upgrade to newer devices. Rather than giving in to the trend away from desktop machines toward mobile devices, buyers stuck with tried-and-true PCs and bolstered Intel's results in the process. At the other end of the spectrum, though, IBM (NYSE:IBM) continued to struggle, falling 12% and notching an extremely rare two-year streak as the worst-performing Dow component. Despite its efforts to become a major player in the cloud-computing and data-analytics businesses, which offer high margins and plenty of growth prospects, IBM has struggled to overcome the challenges of its declining lines of business. As IBM focuses perhaps too much on stock buybacks to boost earnings per share in a somewhat artificial manner, IBM investors hope the company will jump-start organic growth in 2015 to reinvigorate its turnaround efforts. 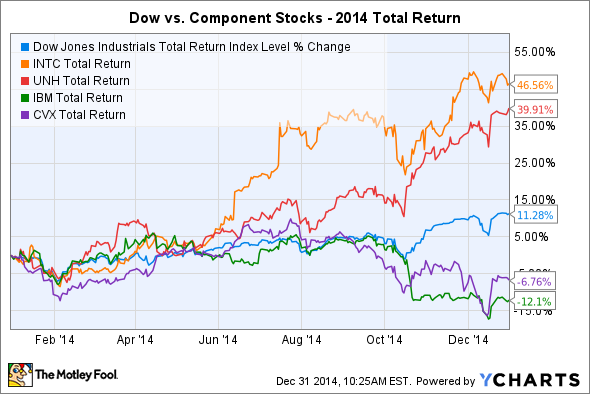 Meanwhile, two other Dow components have seen major trends influence their share prices. On the positive side, UnitedHealth (NYSE:UNH) surged 40% in 2014 thanks to rising membership rates tied to healthcare reform. Even though UnitedHealth didn't initially commit fully to participating in health insurance exchanges established under the Affordable Care Act, the health insurer has done an about-face in 2014, establishing a presence in nearly two dozen states and looking to bolster its earnings into 2015 and beyond. Source: Flickr user Lindsey G.
On the other hand, oil giant Chevron (NYSE:CVX) has predictably suffered from the recent plunge in crude oil prices, with a 7% decline reflecting the potential drop in earnings Chevron will experience in 2015 if crude doesn't rebound quickly. Already, the Dow's energy stocks had faced the major challenge of keeping production levels up, and plunging prices will only send total revenue falling even further as markets seek a new equilibrium between supply and demand. Dow investors saw a sixth straight year of gains in 2014, but within the index you'll always find crosscurrents between winning and losing companies. Seeking out the winners while avoiding the losers is difficult, but it's a worthwhile pursuit that can greatly enhance your long-term returns.